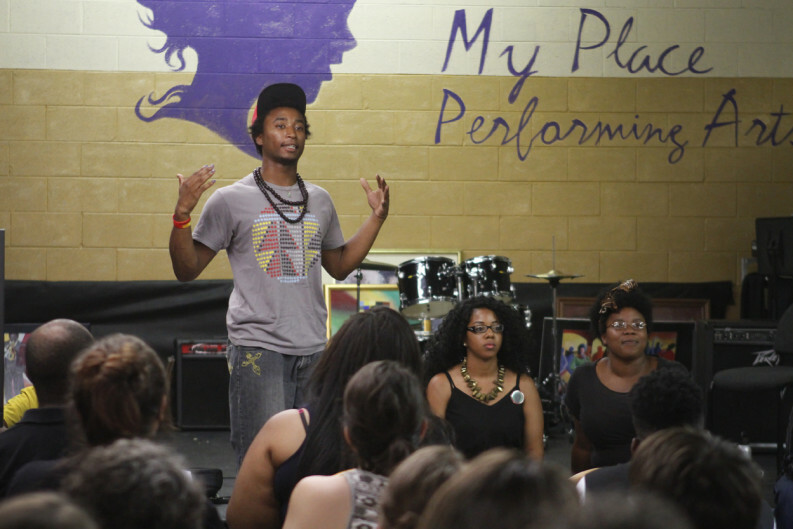 The first official meeting of a local Black Lives Matter chapter drew a standing-room-only crowd to the My Place Performing Arts Center in East Knoxville Wednesday night. More than 80 people turned out to learn more about the newly formed Black Lives Matter Knoxville branch, a local iteration of a national movement of activists that took root after the Trayvon Martin shooting in 2012 as “a response to the virulent anti-Black racism that permeates our society,” according to its website. Coy Kindred, one of the event’s organizers, says she and others had been involved with the movement in different ways over the past couple of years, but were moved to start a formal Knoxville organization and start recruiting members after a fire was set outside of the College Hill Seventh Day Adventist Church in June. Fire investigators have said the fire was an act of vandalism. BLM Knoxville would like to see it investigated as a hate crime. Most immediately, the group hopes to convene more black people to discuss black issues and plot a path forward. They asked that only blacks sign up for a mailing list to receive future information about BLM Knoxville, but encouraged people of other races—which made up more than half the crowd—to get involved in the fight against racial injustice in other ways, such as joining the group Knoxvillians Against Injustice. While Wednesday’s gathering marked the first formal meeting for BLM Knoxville, there have been some past #BlackLivesMatter demonstrations in Knoxville. A protest was held at the intersection of Morrell Road and Kingston Pike on Dec. 14 last year, and on display during the meeting was a video (linked below) shot during the Week of Righteous Resistance on July 23. Many hoping to grow BLM Knoxville have also traveled to other cities to take part in workshops on social organizing and demonstrations, and to network with other activists following fatal police encounters that claimed the lives of unarmed black men in Ferguson, Mo. and Baltimore. Organizer David Hayes recounted his recent experience attending a national Black Lives Matter conference in Cleveland where he and dozens of others had a run-in with police after officers arrested a 14-year-old boy off a bus nearby. Police have said the boy was under the influence of alcohol, but Hayes maintains the young man—who was not affiliated with the conference—was sober. That encounter made national headlines when a transit cop pepper-sprayed a crowd of people attempting to encircle the police cruiser to stop the boy’s arrest. A good portion of the meeting Wednesday involved hearing ideas from people in the crowd about pressing issues facing the black community, what they envision for BLM Knoxville, and what sorts of action or changes they’d like to see locally. Ideas ranged from limiting the number of liquor stores allowed to operate along Magnolia Avenue to potentially putting forward a candidate for local political office, such as mayor or City Council. Other ideas included pushing for more black history to be taught in schools, finding ways to hold law enforcement and politicians accountable for their actions, spending one-on-one time with kids in the community, fundraising for school supplies or other needs, and making people in general more aware of black culture. Toward the end, organizers encouraged folks that proposed ideas to step up and be a leader in that area, whether backing a new political candidate or just informing more people about the group and what it hopes to accomplish.